Zone boarding, an aviation standard for decades, will soon be a thing of the past for Delta customers as the airline makes a global shift to boarding by branded fare purchased. This is the latest evolution in Delta’s multi-year work to bring consistency, simplicity and clarity to the gate and boarding experience, efforts that have driven all-time high customer experience scores. SkyMiles Medallion Members and eligible Delta SkyMiles American Express Credit Card Members will continue to receive priority boarding. The boarding order change – coming to all Delta-operated flights globally starting Jan. 23 – will be accompanied by new color accents distinguishing Delta’s fare products (Basic Economy, Main Cabin, Delta Comfort+, Delta Premium Select/First Class and Delta One), each of which, in addition to Sky Priority, will have a specific, complementary color – from booking through boarding. The colors are inspired by Delta’s primary brand palette and the Passport Plum shade of purple introduced with the global airline’s 2018 Zac Posen-designed uniforms. 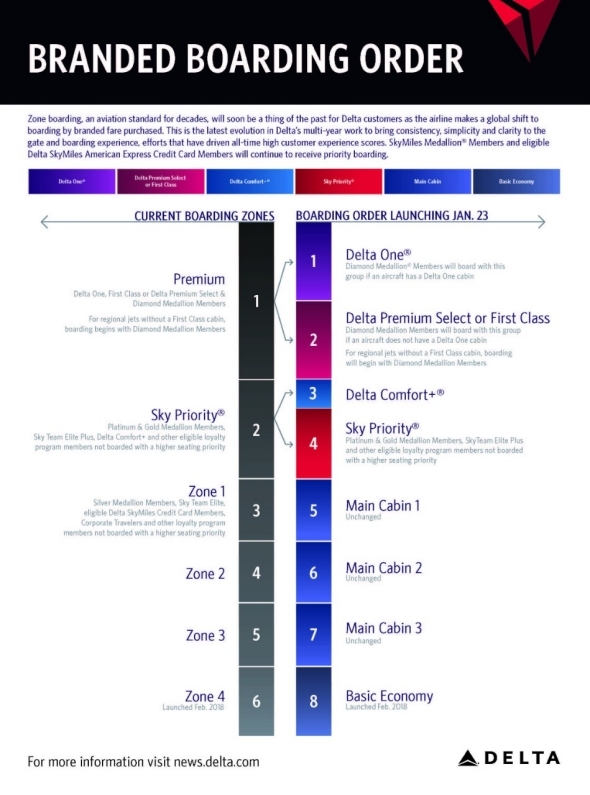 Branded boarding builds on Delta’s latest boarding enhancement, the addition of zone 4 earlier this year, specifically for Basic Economy customers. This change resulted in customer satisfaction scores improving dramatically for the reduced number of customers in zone 3, and improving in every other zone, including by double digits for the Main Cabin zones. Basic Economy customers are notified during the shopping experience that their carry-on bag may need to be checked at the gate, free of charge, which helps manage expectations for checking bags at the gate. This practice will continue with the introduction of Delta’s new branded boarding order. While new colors associated with each branded fare will be visible on boarding screens and signs at the gate starting on Jan. 23, they will be visible to only to a small number of customers in the digital shopping experience to start. A gradual roll-out to all customers on delta.com and the Fly Delta app in accordance with best practices for large digital changes will allow Delta to gather customer feedback for continuous improvements until the rollout is complete in 2019. Delta continues to put boarding under the microscope, looking at new ways to organize and test concepts live with customers – such as the use of digital screens instead of static boarding signage, like pillars. To help keep customers informed, the airline has also been a leader in adding larger information display screens above the door to Jetways and pushing boarding notifications from the Fly Delta app.